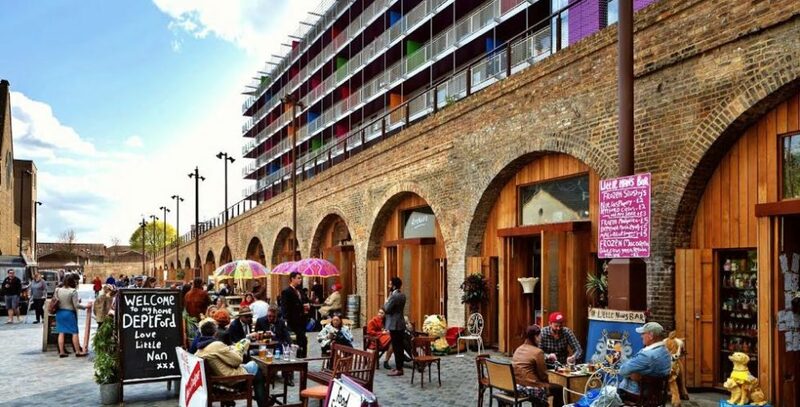 Just one stop from London Bridge station, Deptford is rapidly becoming the capital’s must-visit location. This hidden gem is a regeneration area with loads of places to sample, including art galleries, coffee shops, restaurants and deli’s as well as high street shopping. To help give you a taste of some of the exciting things happening in Deptford, we thought we’d highlight a handful of the businesses who have chosen to use a Dot London web address to help them stand above the rest. Anthology is an award-winning residential property developer with a number of projects based around London, including Deptford. In the heart of one of south-east London’s most vibrant and creative neighbourhoods, Anthology Deptford Foundry sits on the site of a former metal foundry formed in 1831. The original foundry on Arklow Road was once a thriving centre of design excellence, producing a variety of metal goods from propellers to manhole covers. The design and architecture of Anthology’s new homes have been inspired by this rich industrial history. The team at Forest aim to “bring nature into your home” as house plants and cut flowers are natural mood enhancers that help improve indoor air quality by naturally filtering polluted air. With two London-based stores, one in East Dulwich and the other in Deptford, Forest stock easy to care for house plants and succulents. To compliment their plants, they stock a range of pots, lifestyle and natural spa products. They additionally hold monthly classes teaching basic flower arranging skills, terrarium building and wreath making. Marcella celebrates simple, delicious food and drink, focusing on the best seasonal Italian and British produce as well as a strictly all Italian wine list. They believe in creating a warm and welcoming atmosphere for their guests. Marcella’s simple menu, which sees changes throughout the week, reflects the best possible seasonal produce available, and always features pasta made that day. They also have an amazing basement area which is available for private dining. Artworks Creekside Deptford is a diverse creative and commercial workspace hub where people looking for inspiration can discover original ideas brought to them by the people who create them. Creekside is home to an independent café, artisan bakery, pizza restaurant, coffee roastery and hydroponic vertical farm, alongside a growing number of design studios, agencies and filmmakers. They have a range of affordable and flexible small commercial premises available for your growing business needs. Tideway has the task of delivering the Thames Tideway Tunnel, which is anticipated to be completed in 2024, and the Deptford Church Street location is a key part of this exciting project. The site may not be located directly on the river, but the work there will connect to a major sewer below the ground that is responsible for thousands of tonnes of sewage pollution. They’re digging a shaft that will be the same size of the Arc de Triomphe right next to the Grade I listed St Paul’s church, which will connect to the Greenwich connection tunnel, before it sends sewage into the main super sewer, intercepting any nasty spills and clean up the Thames for the good of the city, its wildlife and you. Based under the arches of Deptford mainline railway station, Studio 101 London is 102m2 of space for hire for photo and video shoots, auditions, business meetings, training courses, seminars, workshops and events. They aim to provide an affordable and convenient service at great value for money, open seven-days a week and offering studio hire from as little as an one-hour booking. They also provide recommended production services, graphic designers, photographers, videographers, MUA, hair dressers and stylists to their customers.